Pomegranate trees---or shrubs---are grown in subtropical climates. Fruits on the pomegranate tree typically grow to about 2 ½ to 5 inches in diameter. When harvesting, you should cut them near the base of the fruit with clippers rather than hand pulling them. This preserves the stems, which not only look nicer when using pomegranates as decorations, it also increases their shelf life. Pomegranates can last for up to seven months in temperatures just above freezing. Expect to harvest your pomegranate tree in two or three years after planting. However, some trees bear fruit in one year. Notice when the flowers bloom. Harvesting occurs approximately six to seven months after bloom, typically in September. Wait until the pomegranates are fully ripe. They have a base color of yellow with a bit of light pink or red on top. If the fruits over-mature, they will crack open. Check after it rains, which can speed up the ripening process. Tap the fruit that look fully ripe. Harvest if it makes a metallic sound like tapping your fingernail on a metal pot. Continue to harvest the fruit as they ripen, which usually takes a couple of weeks. The Wonderful pomegranate was originally produced in Florida in 1896. This is the most common commercially-available breed due to its tough protective outer skin and its vinous flavor. This variety also produces the largest fruit, but takes the longest to ripen, sometimes requiring harvest as late as October. Currently, Wonderful pomegranates are the leading variety grown commercially in California. The Early Wonderful variety of pomegranate matures two weeks ahead of the Wonderful pomegranate. When fully matured, it is a medium-sized bush that blooms late but is still quite productive. The flowers on this variety are a stunning orange-red color and very fertile. The Sweet pomegranate's juice is much sweeter than the Wonderful varieties, and lighter in color. The juice is so sweet, in fact, that it is commonly used in fruit punches. The fruit is a bluish-red color when mature. 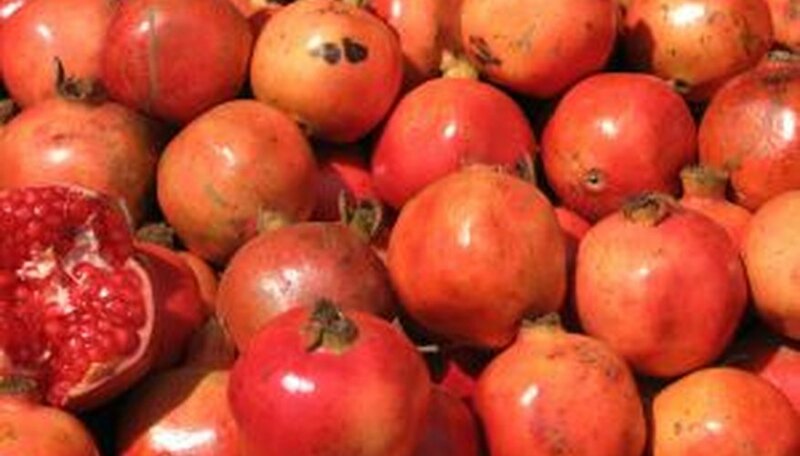 This variety has thinner skin, matures earlier and has softer seeds than the Wonderful pomegranate. 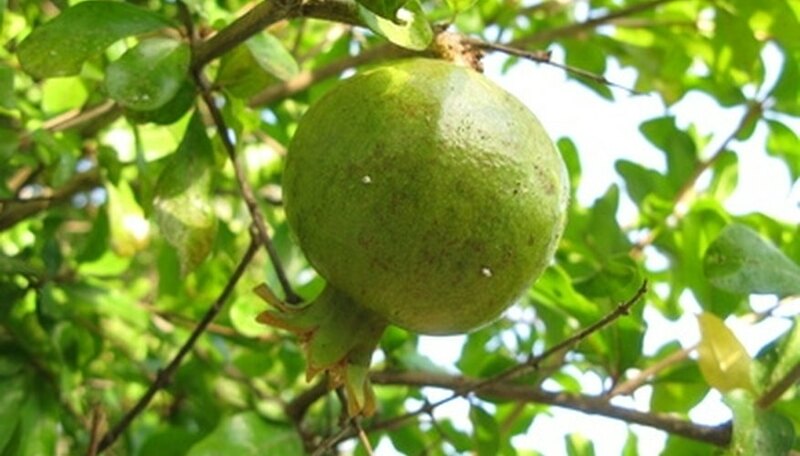 Grenada are an extremely early maturing variety, with its fruit maturing an entire month before Wonderful pomegranates. The fruit and flowers of this bush are a deeper red and the final bush can mature to the same height as the Wonderful, but it produces a slightly less tart fruit. Choose a sunny spot in your yard in which to plant the pomegranate seedling. Wet the ground to loosen it for planting. Nevada soil is high in alkalinity, giving it an advantage in nourishing a pomegranate tree. Pomegranate is a tolerant plant that grows well in ordinary desert dirt. Dig approximately nine inches into the earth. Chop at the large chunks of ground to break them apart. Fill the hole halfway with loosened earth. Place the pomegranate seedling, carefully, into the hole. Make sure the stalk and leaves of the plant are above ground level. Form a mound of dirt around the seedling, and hollow out a welled area between the plant and dirt mound. Water the pomegranate tree every two to four weeks during the summer months. Give it about five gallons of water each time. Maintain the pomegranate tree for three years before it reaches fruit-bearing maturity. Keep it on the bi-weekly watering schedule during the dry season. Select pomegranates that are free of bruises and cracks, as these tend to not dry as well. Place the pomegranates on a wire rack and space them so they aren’t touching each other. The wire rack will allow air to circulate around them and help them dry. Allow the pomegranates to sit on the rack in a cool, dry place for two to three weeks. Make sure they are kept out of direct sunlight, as this may cause them to dry out too quickly. Remove the pomegranates from the rack and feel each one to make sure there are no soft spots or areas that have gone bad. Utilize your pomegranates in whatever decorative fashion you choose, and discard them in three to four months. Know whether your soil is alkaline or acidic. Low acid soils have a pH above 7.5. High acid soils have a pH below 5.5. Purchase a soil test kit from a hardware store, nursery or online if you need to test yours. If you don’t want to test, ask a worker at your nearby nursery for a rough estimate of soil pH in your area. Use a nitrogen fertilizer, such as ammonium sulfate, for alkaline soils. For acidic soils, use a neutral fertilizer, such as calcium nitrate. Fertilizing is important the first two springs after planting, but as trees mature they need less. Fertilize in two applications, using four ounces each time for newly planted young trees. Follow instructions included with fertilizer. After the first two years, fertilize in the fall or winter using eight ounces. Add an additional ounce each year until you reach sixteen ounces. Prevent zinc deficiency, which is difficult to diagnose, by applying a small amount of zinc spray to foliage. Zinc deficiency often causes yellow-mottled leaves. Ensure against other mineral deficiencies by liberally applying compost around base of tree several times a year. Using compost guarantees you won't have to diagnose a specific deficiency because it contains all nutrients. Plant pomegranates in the sunniest, warmest spot in the yard. Dig a hole that is 2 feet larger and deeper than the pomegranate sapling's root ball, using a shovel. Remove any rocks or debris from the hole. Remove the pomegranate sapling from its plastic container. Break apart the root ball with your fingers and untangle the roots, if necessary. Place the tree in the hole so that it's vertically straight and sitting at the same depth as it was in its original container. Spread the roots out with your fingers. Fill in the hole with dirt. Water until the soil is saturated. Water the pomegranate tree when the soil becomes dry. Fertilize in the spring and fall with an 8-8-8 fertilizer, suggests the Arizona Cooperative Extension. Follow label instructions for dosage. Prune back the pomegranate tree annually to remove weak growth. Trim back suckers and remove shoots that cross against other shoots or grow downward, using anvil pruners. Prune the pomegranate tree in the early spring before new leaves appear for best results. Wash all the fruit off the pomegranate seeds. Allow the seeds to dry overnight. Prepare a 6-inch pot for the seeds by filling it with sterile potting medium. Purchase potting medium at a plant center. If the pot is old, wash before using. Place four to six seeds about 1 inch apart on top of the potting soil. Cover the seeds with soil. Seeds should be just under the potting medium. Water the pomegranate seeds. Cover the pot with a plastic zip-lock bag to create a hothouse effect. Keep the soil moist. It's important not to let the seeds dry out. Put the pot in a warm sunny spot. The pomegranate seeds will germinate in two to six weeks. Transfer the seedling to a separate larger 12-inch pot when the seedling has four permanent leaves. Put the seedling in a sunny spot and keep the soil moist, but not dripping wet. Place pot outside for two hours to harden. Each day increase the amount of time the plant is outside. Plant the pomegranate tree outside after it has hardened.